I cut the puff pastry into two squares using a sharp knife scored a square outline leaving a cm border, then scored the middle section making sure I did not go all the way through. 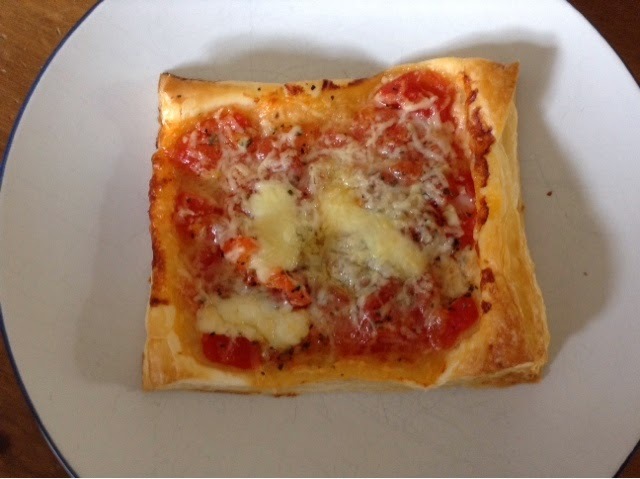 One can of chopped tomatoes, using a slotted spoon I drained of most of the liquid and put a couple of spoons full into a bowl added a squeeze of tomato ketchup and some basil then popped it on to the scored part of my pastry square. I then topped with lots of grated cheese using mature cheddar and some gruyere I had in the fridge. Put them on a baking sheet and cooked on 190 for about ten mins. They were very tasty they had it with baby plumb tomatoes and cucumber and it was a massive success. It would be so easy to do lots of different toppings from ham, chorizo, cooked chicken, sweetcorn even some cream cheese dotted about would be nice. The key though is to keep it simple things you can pop straight on top no preparation and will cook in the ten mins or so.